1969 Farrelly Square tail 6 ft 4"
DESIGNER: Commonly attributed to Ted Spencer for his White Kite model at Shane Surfboards. Foam blank with black glue-line, red/yellow pigment laminate. 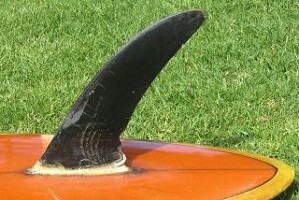 The original fin had been replaced and a leg-rope plug added, probably in the mid-1970s. 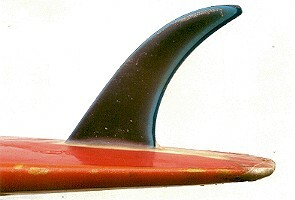 The original fin had been replaced in the 1970s by a more modern fin (see below). At restoration in 1996, the non-original fin was removed and not replaced. Farrelly/address - black script at sweet spot. Deck: Yellow laminate,orange rails, black pin-lines. Bottom: Red laminate, orange rails, black pin-lines. 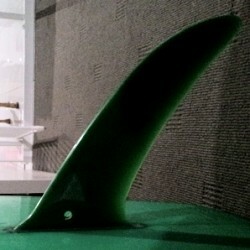 Three colour laminate fin added by Mark Jameson, Limited Edition Surfboards, added circa 1992. Purchased Shoalhaven Heads, September 1996. Fin removed and Volan/pigment repairs. Some deck de-lamination and classic leg-rope damage (pre rail-saver). On this board the orange rail lap (the combination of the red bottom and the yellow deck rail lap) is an example of the skill of the glasser. Extensive damage to the blank where the fin was probably indicates it was glassed into a recessed box to improve strength, a feature of Farrelly Surfboards at the time. 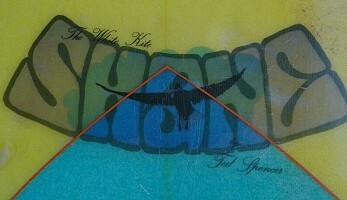 Notably produced as the White Kite by Ted Spencer this design was a huge seller for Shane Surfboards, and was a common shape for many contemporary manufacturers. It was a stock design for Farrelly Surfboards in Nov 1969, along with Midget Farrelly's Rounded Pintail and Side-Slipper designs. At a cost of $125.00, it was a premium product trading on Midget's designs and an immaculate finish that set the benchmark for the rest of the industry. CONDITION: 5, lacks fin and possible box. The White Kite by Ted Spencer, 1970. Geoff Cater (1999-2018) : www.surfresearch.com.au : Farrelly Square-tail, 1969.